To Cite: Taherirad A, Jahanbakhsh R, Shakeri F, Anvary S, Ghaemi E A. Staphylococcal Cassette Chromosome mec Types Among Methicillin-Resistant Staphylococcus aureus in Northern Iran, Jundishapur J Microbiol. 2016 ; 9(8):e33933. doi: 10.5812/jjm.33933. Background: Methicillin-resistant Staphylococcus aureus (MRSA) is a common cause of nosocomial and community-acquired infections around the world. Staphylococcal cassette chromosome mec (SCCmec) typing methods are often used to study MRSA molecular epidemiology. Objectives: The current study was designed to explore the distribution profiles of different SCCmec types among methicillin-resistant S. aureus strains isolated from hospitals in Gorgan, in northern Iran, and to correlate the types into observed bacterial virulence factors. Materials and Methods: Staphylococcal cassette chromosome mec typing of 62 MRSA strains isolated from patients and health-care workers in Gorgan was performed using multiplex polymerase chain reaction (PCR) assay. The prevalence of the strains was then compared according to isolation source, antibiotic susceptibility profiles, biofilm production, and the presence of the Panton-Valentine gene in isolates. Results: The most common SCCmec type was type III, with a frequency rate of 76%, followed by types IV, I, and V, with frequency rates of 11.2%, 4.8%, and 3.2%, respectively; three isolates (4.8%) were not typeable by this method. SCCmec type I was only isolated from blood culture, and types IV and V were mainly isolated from wounds and urine samples; SCCmec type III was isolated from all of the clinically samples. All of the MRSA strains that were isolated from healthy carriers were type III. Multidrug resistance in the type III strains was higher compared to the other types. The frequencies of Panton-Valentine and biofilm production were significantly lower in the type III strains compared to the other SCCmec types (P < 0.05). Conclusions: Similarly to other geographical regions of Iran, the SCCmec type III MRSA strain was the most frequently isolated strain from patients in Gorgan. Staphylococcal cassette chromosome mec type III showed fewer virulence factors compared to other SCCmec types. Because Staphylococcus aureus is ubiquitous, humans are frequently (and inevitably) exposed to the bacterium during the course of their lifetimes. Short- or long-term colonization of the bacterium can often occur in different human bodily surfaces (especially in the nares) during the different stages of life. Although the bacterium is apparently harmless, the occurrence of any breakage in the natural barriers of the host’s defenses (e.g., a skin wound) can lead to the bacteria’s infiltration into deeper organs, which can then lead to a wide range of conditions, ranging from simple to lethal (1, 2). The rapid global distribution of Methicillin-resistant Staphylococcus aureus (MRSA) strains, even between continents, is the major concern of S. aureus infections today (3). Methicillin resistance in S. aureus is encoded by mecA gene sequences that are located in a mobile genetic element identified as Staphylococcal cassette chromosome mec (SCCmec). Staphylococcal cassette chromosome mec is a relatively large genetic element that, in addition to mec gene complex (responsible for methicillin resistance), carries ccr genes (which encode for recombinase proteins) and a J region (“joining” region, previously known as the “junkyard” region). These genes have different allotypes, and different combinations of the allotypes from the three genes lead to different types and subtypes of an SCCmec gene segment that is seen in isolated S. aureus (4, 5). Different combinations of the genes in different SCCmec types also lead to the strains’ different antibiotic susceptibilities. Types II and III SCCmec segments are longer and possess multidrug resistances to strains that carry the elements; these types have frequently been demonstrated in hospital-acquired MRSA (HA-MRSA) strains. In contrast, IV type is the shortest Staphylococcal cassette chromosome mec segment; it does not possess any simultaneous antimicrobial resistance to the conveyor bacterium. Instead, these strains usually have the highest transmission rates compared to the others; this is the type that is usually seen among community-acquired MRSA (CA-MRSA) strains (6). Since methicillin resistance indirectly affects other virulence factors and enhances the pathogenesis of the bacterium, conditions caused by MRSA strains usually have the worst clinical manifestations and are the most difficult to treat compared to susceptible and avirulent strains (3). In conclusion, because the prevention of MRSA distribution among the population is a major task for health-care managers, the application of proper MRSA identification and typing systems is crucial for any surveillance systems to be able to explain epidemiological procedures and to establish decisive strategies for MRSA infection control. Several new methods have been introduced for MRSA typing in recent years, including pulsed-field gel electrophoresis (PFGE), multilocus sequence typing (MLST), spa typing, and SCCmec typing (7). Shakeri et al. (8) previously studied the spa typing of MRSA strains in Gorgan. The current study focused on SCCmec typing and antibiotic susceptibility profiling of MRSA strains isolated from patients admitted to university hospitals in Gorgan. The current study was conducted using 62 MRSA strains isolated from health-care workers and clinical samples obtained from patients admitted to university hospitals in Gorgan from December of 2013 to May of 2014. Phenotypic tests (including gram stain, catalase, DNase, coagulase tests, and growth on mannitol salt agar) were applied for primary identification of S. aureus isolates; coagulase (coa) gene PCR was performed according to the procedure introduced by Afrough et al. (9) for confirmation. The methicillin resistance of the isolates was assayed using two complementary methods: 1) the disc diffusion method (according to clinical and laboratory standards institute [CLSI] recommendations) and the evaluation of inhibitory growth zones around cefoxitin disks (30 µg) on Mueller-Hinton agar; and 2) a confirmatory test of PCR amplification of the mecA gene by using specific primers (7). Antibiotic susceptibility profiles of the isolates against nine commonly used antimicrobial agents including clindamycin (2 µg), ciprofloxacin (5 µg), erythromycin (15 µg), co-trimoxazole (25 µg), nitrofurantoin (300 µg), norfloxacin (10 µg), penicillin (10 U), rifampin (5 µg), and tetracycline (30 µg), all manufactured by the Rosco Company were assayed using the disk diffusion method and in accord with CLSI recommendations (10). Genomic DNA for subsequent PCR was isolated from 1-mL overnight culture lysed with the lysozyme phenol chloroform method and treated with N-lauroylsarcosine sodium salt 2% (300 μL), proteinase k 100 μg (30 μL), and RNase A(5 μL). The DNA was extracted by phenol chloroform-isoamyl alcohol, chloroform, and cold ethanol (10). Finally, the DNA was resolved again in distilled water and kept in a frozen state (-20°C) until the assay procedure was performed. Staphylococcal cassette chromosome mec typing (I, II, III, IV, and V) and subtyping (IV subtypes a, b, c, and d) were conducted using the multiplex PCR method and the application of primers and protocols according to Zhang et al.’s 2005 study (11). 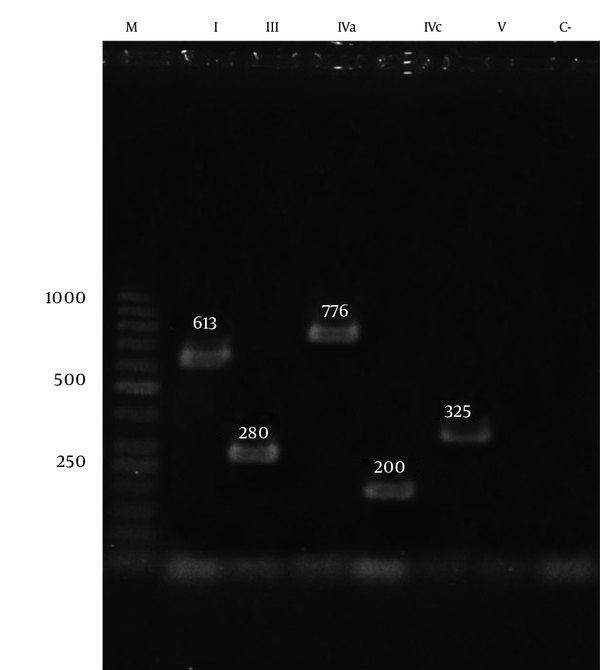 Two μL of extracted DNA was added to 23 μL of PCR mixture containing 5 µL of Taq buffer, 5 µL of MgCl2, 200 µM of dNTP, 1U of Taq polymerase, and 0.3 µL of each primer. The amplification was performed in an Eppendorf thermocycler, beginning with an initial denaturation step at 94°C for 5 minutes, followed by 10 cycles at 94°C for 45 seconds, 65°C for 45 seconds, and 72°C for 1.5 minutes, as well as another 25 cycles at 94°C for 45 seconds, 55°C for 45 seconds, and 72°C for 1.5 minutes, ending with a final extension step at 72°C for 10 minutes and a hold at 4°C. Each running of the PCR assays incorporated a reagent control (without template DNA). The PCR amplicons were visualized using a UV light box after electrophoresis on 2% agarose gel containing 0.5 μg/ml ethidium bromide (11). For further confirmation, random PCR amplification products from each class of identified types and subtypes were sequenced by Bioneer corporation; the observed sequences were aligned with the gene sequences recorded in the national center for biotechnology information (NCBI) databases. In order to explore biofilm formation by the isolates, exact protocols that have already been detailed by Hasannejad Bibalan et al. (12) were applied; Panton-Valentine leukocidin (PVL) analysis and virulence gene analysis were conducted using primers and protocols from Kamarehei et al.’s study (13). The data was imported to SSPS statistical software (version 16), and a chi square test was applied for statistical comparisons. P values lower than 0.05 for the differences were considered to be statistically significant. A total of 62 samples were considered to be MRSA according to both resistance to 30 μg cefoxitin disks and because they contained the mecA gene. The age range of patients with MRSA-positive samples was 1 - 88 years (39.21 ± 23.92 years). We found no significant differences in frequencies of MRSA infections between genders (32 [52%] female versus 30 [48%] males). Of the 62 MRSA cases, 56 (90.3%) were isolated from hospitalized patients, and six isolates were taken from the noses of healthy carriers (Gorgan hospital employees). The MRSA cases were isolated from blood cultures (19 cases) and wound infections (14 cases). Three (4.8%) out of the 62 isolates were not typeable by the multiplex PCR method; SCCmec typing of 59 isolates revealed that the type III strain (with a frequency rate of 76%) was the most frequently isolated strain, followed by types IV (five cases of type IVa and two cases of type IVc), I, and V, with frequency rates of 11.2%, 4.8%, and 3.2%, respectively. Type I strains were only isolated from blood cultures, while the type IV and V strains were mainly associated with wounds and urine samples; type III strains, however, were detected in all specimens. All cases that were isolated from health-care workers belonged to type III SCCmec (Table 2). M, marker; the SCCmec types were I, III, IVa, IVc, and V; C-, negative control. aMRSA isolated from the nose or hands of health-care workers (HCWs) employed in hospitals in Gorgan, Iran. The mean age of the patients who harbored SCCmec type III (42.3 ± 22.1 years) was notably higher than that of other groups (29.2 ± 29.6 years), but the difference was not statistically significant (P = 0.07). As shown in Table 3, 71.8 % of SCCmec type III isolates had biofilm production capabilities, but all isolates that contained other SCCmec types were biofilm producers; the differences were statistically significant (P = 0.045). The frequency of PVL-gene-positive strains among the SCCmec type III strains was 11.5%, while among other SCCmec types the frequency was 44.3% (Table 3); the differences were statistically significant (P = 0.01). It should be noted that only two isolates had SCCmec type V, and both were carriers of the PVL gene. Our analysis of antibiotic resistance among the 62 isolated MRSA strains for nine commonly used antimicrobial agents showed that 95.2% of isolated MRSA strains were resistant to penicillin. The frequencies for other agents were as follows: erythromycin and tetracycline (58.1% for both), clindamycin (56.6%), norfloxacin (40.3%), ciprofloxacin and cotrimoxazole (35.5% for both), rifampin (14.5%), and nitrofurantoin (3.2%). The frequency distributions of simultaneous multidrug resistances related to SCCmec types are shown in Table 4. It is clear that the frequency of multidrug resistances among MRSA strains that carry the SCCmec type I was notably higher than in other types, although the differences were not statistically significant (P > 0.05). Staphylococcal cassette chromosome mec typing is an imperative component of any surveillance system for explaining epidemiological procedures and to implement effective prevention strategies against MRSA-related infections. Our findings have shown that SCCmec type III was the most frequently observed type (76%) among MRSA strains isolated from Gorgan hospitals. Consistent with our results, similar types and frequencies have been reported by other researchers from Iran (and even from other Asian countries); the proposed explanation for this harmony in the results are likely that all of the isolates originated from a unique ancestor (14-16). Still, a literature review shows that SCCmec type II is the most frequently isolated type in certain regions of Asia (e.g., South Korea and Japan) (16-18), while among European and American populations, SCCmec type IV had the highest frequency, replacing type III in prevalence (19-21). Distributions from different original strains are believed to explain the variations that have been observed in SCCmec types and frequencies in different parts of the world. Several MRSA eradication programs that have been implemented in hospitals in developed countries may also be the main cause of replacing some strain types with others in these regions. Some of the isolates (4.8% of the total) were not typeable using this method, which is similar to what previous studies have reported from Iran and other regions of the globe (22, 23). These isolates may convey other SCCmec types (e.g., VI or XI SCCmec types) and/or other unknown types that were not investigated in our study. Among the nine antimicrobial agents used for antibiotic susceptibility testing of the isolates, the highest resistances were observed against penicillin, tetracycline, erythromycin, and clindamycin, respectively. The highest antibiotic sensitivity of the isolates was against nitrofurantoin, followed by rifampin. The lowest frequency of rifampin resistance among different MRSA strains makes it a good therapeutic choice for MRSA control; since the drug is a first-line therapeutic agent for treatment of Mycobacterium tuberculosis infections, however, precautions should be taken not to administer it in an irregular fashion. On the other hand, nitrofurantoin is a suitable candidate in empirical therapy of urinary tract infection due to MRSA. In our study, the frequency of simultaneous resistance to more than six antimicrobial agents among SCCmec type III was 44.6%, while the frequency among other SCCmec types was 26.7%. Staphylococcal cassette chromosome mec type III is the longest SCCmec type and is capable of joining itself to other genetic elements, including Tn554 and pT181 plasmid, thus adding further resistance against other antimicrobial agents. The observed resistance to more than six drugs among SCCmec type III strains therefore was predictable; similar findings have already been reported by other researchers (6). Biofilm production as a virulence factor is one of several strategies that is implemented by S. aureus (especially for the production of nosocomial infections) and is the main cause for the persistence of these infections. Our survey demonstrated that among MRSA isolates that were SCCmec type III, some lacked biofilm-formation capability; such strains may therefore express weaker binding capacity to artificial surfaces. All of the MRSA strains that harbored SCCmec types other than type III (i.e., types I, IV, and V) were capable of biofilm formation. These results are in accordance with those obtained by Vanhommerig et al. in 2014 and Cirkovic et al. in 2015 (24, 25). Panton-Valentine leukocidin (PVL) is a potent virulence factor that is produced by 2% - 3% of S. aureus strains. The PVL gene is frequently seen in S. aureus isolates, which primarily cause skin or soft-tissue infections and lead to worsened conditions and strains that usually harbor SCCmec type IV or V (26). The correlation of the observed PVL genes with SCCmec types of the isolates in our study showed that the highest likelihood of PVL gene presence occurred among SCCmec type V strains. Because isolates that harbored SCCmec type III were the most frequently isolated in our study, and due to the high occurrence of multidrug resistance in this type, antibiotic susceptibility tests should be conducted prior to any drug administration. Our findings also emphasize the importance of adopting effective strategies for the prevention of MRSA transmission from patients to health-care workers. This work was financially supported by the research and technology deputy of Golestan University of Medical Sciences, which the authors sincerely appreciate. We are grateful to Miss Golriz and Miss Shahdehi for their assistance in the collection of clinical samples. We are also thankful to Mr. Masoud Bazouri for his assistance during the experimental processes.